TUCSON, Ariz.- Arizona's monsoon officially starts June 15. And even though the rain coming this weekend has more to do with what's left of a Pacific Hurricane, the classic monsoon pattern is gearing up. And as the rains roll in, a special center in Tucson will be counting each stroke of lightning. Lightning strikes in the continental US an average of 20 million times a year. We know that because of the data that flows through the Tucson office of Vaisala , a company that measures the weather. Friday morning, Vaisala sensors placed all over the world counted about one-point-six million lighting flashes in six hours. "We're actually at a typical pattern for this time of day in the middle of June.," says Vaisala lightning specialist Ron Holle. He can see monsoon lightning patterns in Mexico now. When they make it to Arizona, we will get almost as much lightning in July, August and early September as other parts of the country might get in a year. Holle says, “We get on average about 600 thousand cloud to ground flashes in July and August and into September which is a very good number. It's one of the higher numbers in the country." Holle: "No, Unfortunately, they respect it after something has happened." To improve safety Vaisala has looked at lightning patterns in National Parks. Grand Canyon gets a lot of strikes--mainly on the rim and after eleven AM. Holle says, "Around 90 percent of all the lightning in the Grand Canyon occurs just during July and August and early September. It's also during the afternoon. So during the afternoons in July and August are very vulnerable to lightning and we do see deaths and injuries there." In the Tucson area, storms tend to develop over the mountains maybe four or five o'clock. "If you're close to the mountains it's a little earlier. 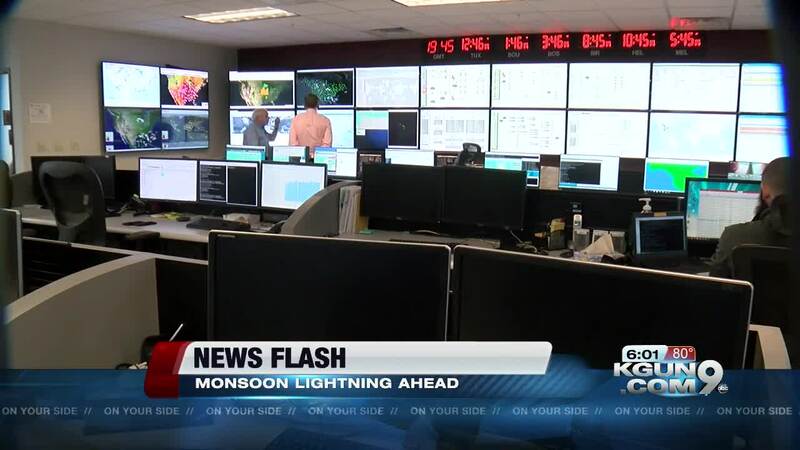 If you're downtown, south and west its more in the evening and as you go further west the lightning frequency drops off very fast west of Tucson." Many people believe a lot of persistent and dangerous lightning myths like the idea that you’re safe if taller objects are near you, or that rubber-soled shoes will protect you because you will not be grounded. To counter those dangerous myths, Vaisala offers a downloadable e-book called “So You Think You Know Lightning”. Here is a lifesaving fact you should remember: If you can hear thunder you are in reach of lightning. To stay safe go to a substantial building or an enclosed car.